How do you solve a problem like Farah? Principled, articulate but pig-headed, she is the whirlwind around whom Tunisian director Leyla Bouzid builds her remarkable debut feature. As I Open My Eyes is set in a very specific time and place: Tunis, summer 2010. It advocates the noble idealism, determination and exuberance of youth but equally acts as a warning cry against stubborn naivete at a point when the first waves of the Arab Spring were beginning to swell. By using the tropes of the coming-of-ager – a rebellious teen and the strained relationship with her mother – as the central touchstone, Bouzid subtly, yet efficiently paints the nascent days of Tunisia’s Jasmine Revolution as a force to be reckoned with. Newcomer Baya Medhaffer is a revelation as Farah. A mop of wild curls, big dark eyes and a broad smile belie a fiery, defiant creative force whose interests lie in changing the path of Tunisia, not towing the line by going to medical school as her mother, Hayet (Ghalia Benali), wishes. Unlike the young nun who once believed the hills to be alive with the sound of music, Farah uses her ability to decry the state of her nation with a band of fellow wannabe activists whose songs range from mournful laments to punk rock. Following up stellar work in Blue Is the Warmest Colour cinematographer Sebastien Goepfert elegantly captures the gentle kisses and caresses of Farah’s first romance. 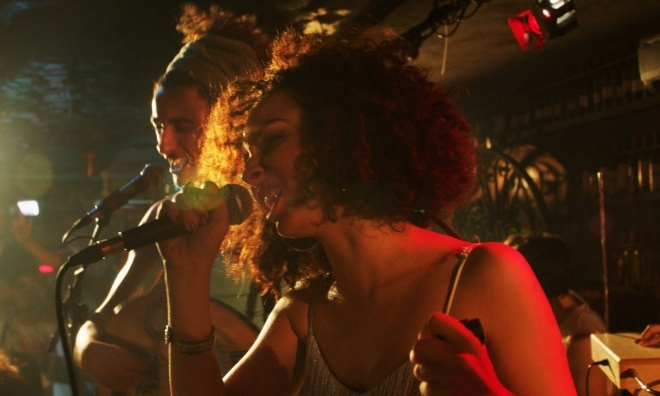 The lyrics of long-haired, lute playing visionary, Bohrene (Montassar Ayari), reinforce the film’s quietly powerful political message and flow with a rhythmical poetry for which Bouzid and co-writer Sophie Chambon should be given due credit. The counterpoint of tender, intimate close-ups lies in longer shots taken from the shadows. Nosey bandmates and intrigued young boys look on as the lovers share an embrace but this snooping alludes to the bigger picture of surveillance and forces out of sight keeping tabs on potentially troublemaking individuals. An early rendition of a song in a bar critical of what Tunisia had become is welcomed by some but angers others. This draws the attention of a long lost flame of Hayet’s, a policeman, who warns her of the attraction her daughter’s views have garnered. Benali burns with a maelstrom of resigned exasperation, pride at Fahar’s convictions and motherly fear, all the while knowing just how similarly passionate she was at that age: the well-balanced combination make for a fine performance. Attempts are made to keep the outside world at arms length, however the touch paper is lit for an inexorable chain of events with the impetuous Farah continually fanning the flames. The script is as naturalistic and free-wheeling as its protagonist; frequent, fluid drops of French into strings of Arabic speak to a nation whose historically fragmented national identity was on the verge of making another radical shift at this time. An engaging, personal take on an event that must be close to Bouzid’s heart, As I Open My Eyes should open your eyes, too and is well worth seeing. International Film Festival Rotterdam runs from 27 January to 7 February. Follow our coverage here. As I Open My Eyes is also available to stream via Festival Scope’s IFFR Live here.